Remember Fogg n' Sudds? Yes, the place that offered up the largest selection of beers in the city at one point in time. I remember the "Tower of Power" and the silly escapades afterwards. Well those days are long gone. 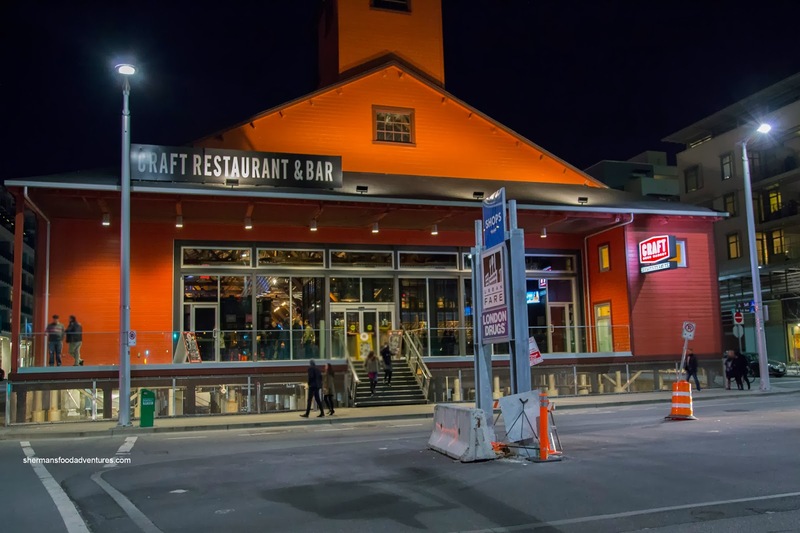 Welcome the new king in town - CRAFT Beer Market (from Alberta). Boasting over 100 beers on tap, it occupies the beautifully renovated Salt Building down near the old Olympic Village. We decided to hit up the place after hockey with Mijune (as always dressed up to the nines) joining us. Obviously, in a place that serves over 100 beers on tap, I had to get in on the action. 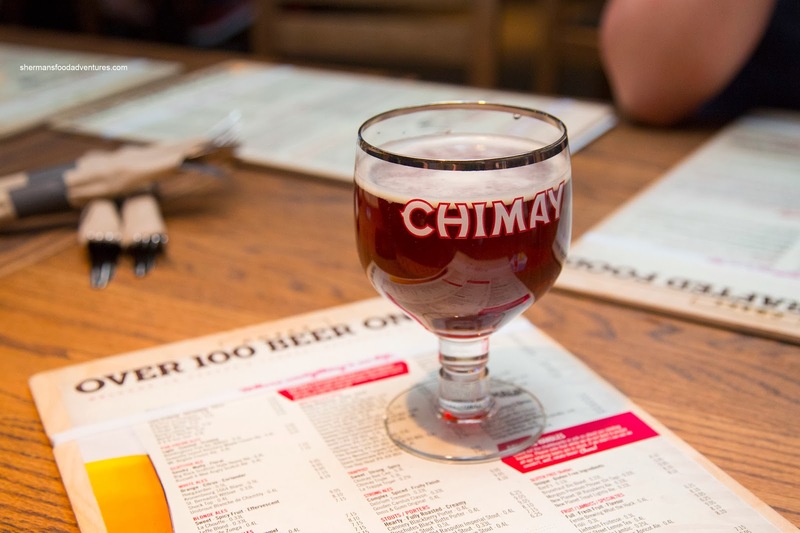 Our server suggested I try the Chimay Red and she was on the money. This went down really smooth with an appealing malt finish. I can see this going with something delicate such as seafood or a salad. But honestly, a salad? We didn't have such food set onto our table. 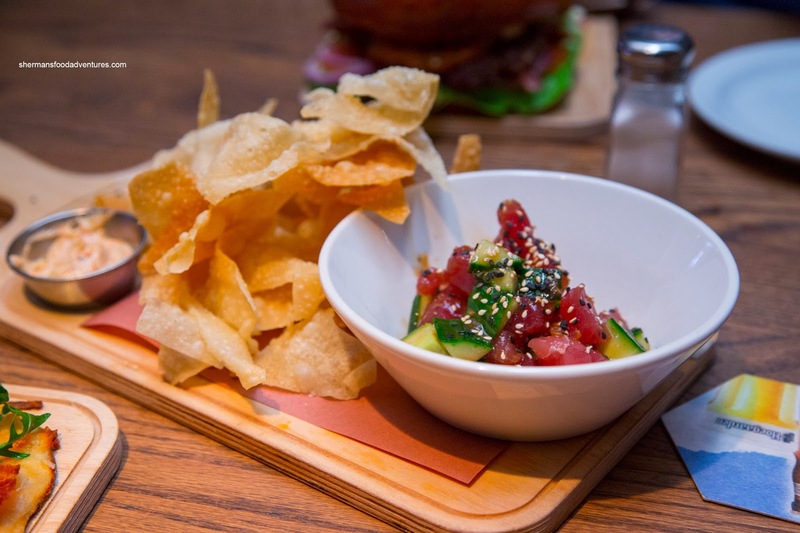 Instead, we decided to share a few items beginning with the Hawaiian Tuna Poke with a side of togarashi mayo. It consisted of Ocean Wise sashimi-grade tuna, cucumber, fresh ginger, garlic and sesame soya vinaigrette served with crispy wontons. We found the tuna to have a nice texture (soft with some chew) while being dressed just enough for flavour without being overpowered. However, the pieces could've been diced up smaller for easier handling with the wonton chips. Next up we tried the Salt & Pepper Wings which were either crispy or soggy dependent on which piece. Some of the mid-wing sections had skin which was not even fried properly, possibly from overcrowding in the deep-fryer. There was a good amount of salt and pepper for effect, however, the meat was rather dry. 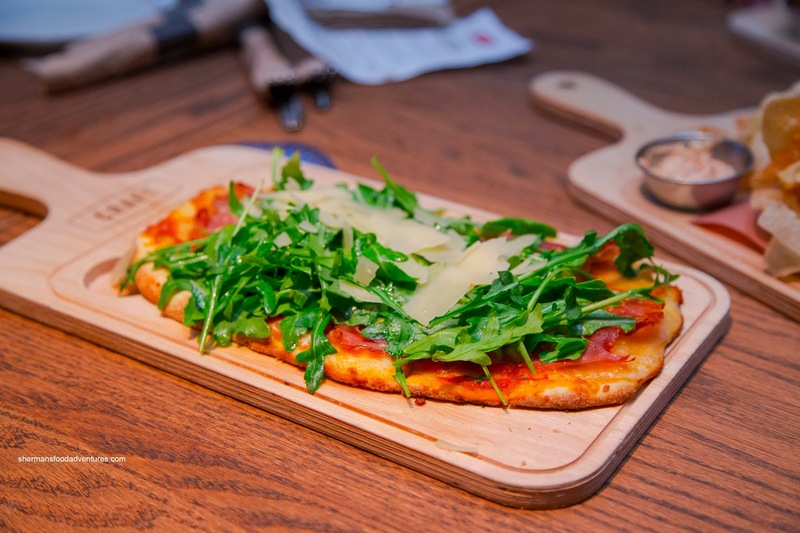 We gave Prosciutto Arugula Flat Bread a go too. Consisting of thinly sliced prosciutto, Grana Padano, fresh arugula tossed with lemon and extra virgin olive oil, this was not devoid of ingredients. So much so, the middle portion became rather soft. With that being said, it was still decent with lots of savouriness combined with the pepperiness of the arugula. 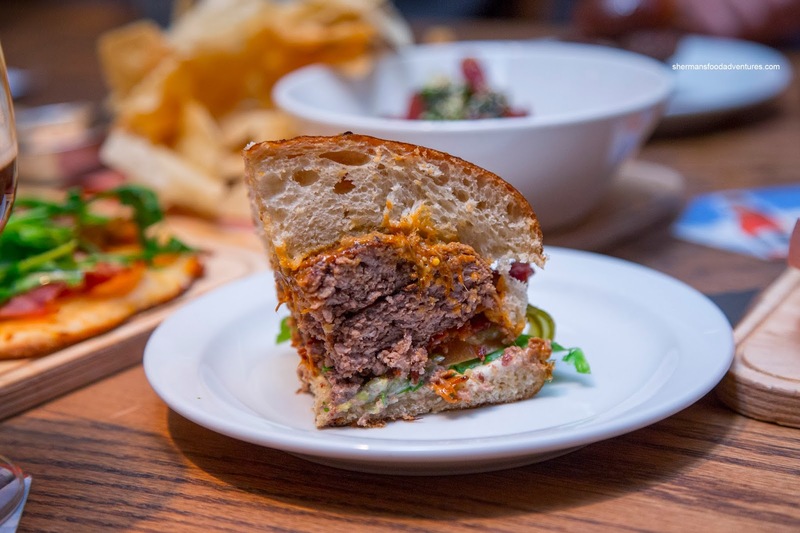 Last, but not least, we tried the 20 Napkin Burger. 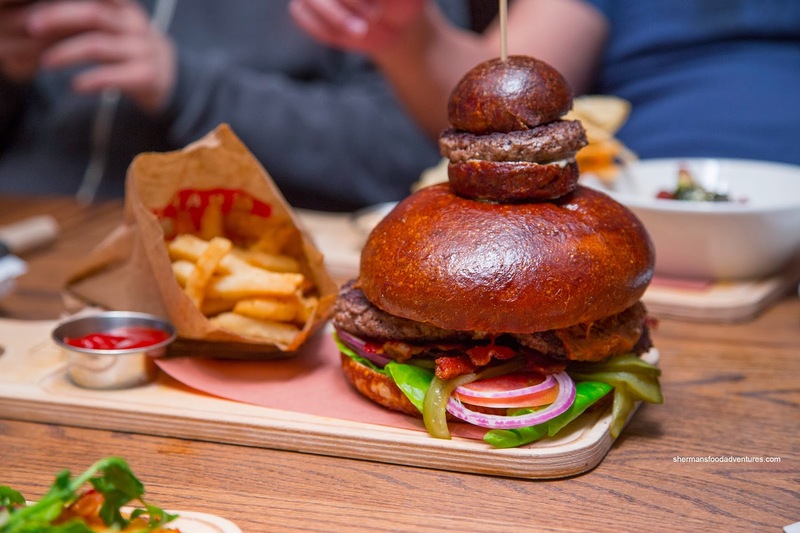 This monstrosity was constructed with two 8oz burgers, 4oz brisket, crispy bacon and beer infused cheese topped by a mini burger. As much as this was impressive to look at, the meat was rather moisture-deficient. It was meaty in flavour though while the crispy bacon, cheese and produce helped the cause. What didn't help was the dry brioche bun, it could've been a touch softer. The side of fries were decent with a slight crispiness and a proper touch of salt. 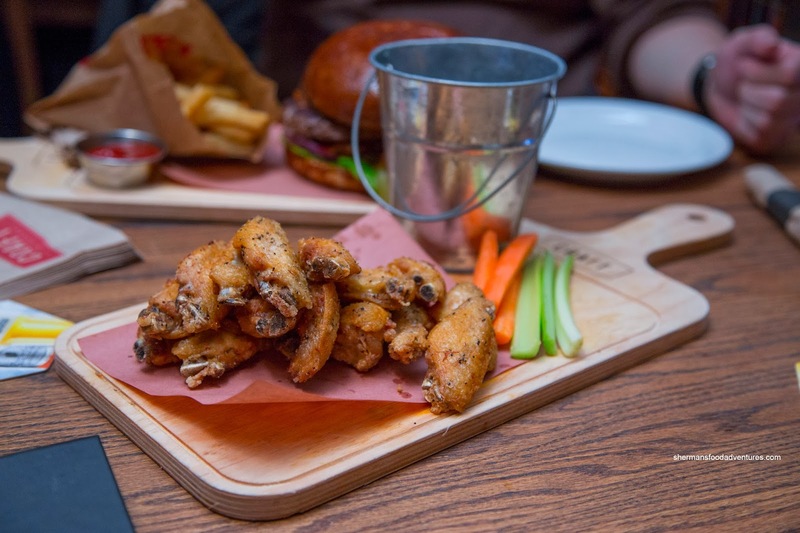 Judging from the items we did try, the food is basically the accompaniment to the impressive beers on tap. Hence, CRAFT Beer Market does exactly what its name implies - offering up an impressive selection of beers. - Holy beer selection Batman! I actually visited the restaurant last week! I went for the Bacon & Blue Cheese Burger and was actually very satisfied. Neither the bun, nor the meat was dry, but it could have been the mayo and mustard that made it somewhat moister and nicer. I agree with you on the point of the food playing second fiddle though!